NJDEP-CleanAirNJ-Clean Air NJ-What's Your Air Quality Today? The USEPA developed the Air Quality Index (AQI) to report daily air quality to the public. The AQI tells you how clean your local air is, and what associated health effects might be a concern in your area. Think of the AQI as a yardstick that runs from 0 to 300. The higher the AQI value, the greater the level of air pollution and the greater the health concern. 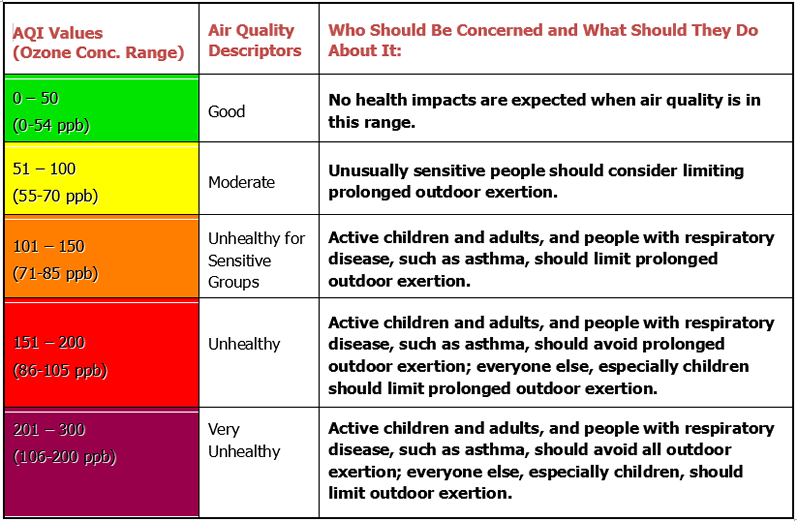 To make it even easier, USEPA color coded the AQI so you can tell at a glance when you need to take precautions. Since an AQI value of 100 generally corresponds to the national ambient air quality standard for smog, AQI values below 100 are considered safe (green or yellow). When AQI values are above 100, air quality is considered to be unhealthy-at first for certain sensitive groups of people, then for everyone as AQI values get higher (orange and red). New Jersey’s level has never exceeded an AQI of 200 – the purple color on the chart – and has rarely been over 150 – the red color on the chart. How Can You Get Daily Air Quality Alerts? Enviroflash, a partnership between the USEPA and NJDEP, sends out alerts to your mobile device or email which notify you on days when poor air quality is forecast to occur. The alert messages include the air quality forecast for the location of your choice and preventative suggestions on how to protect yourself when the air is unhealthy. Sign-up now to receive either an e-mail or a text message to your mobile device! What Do our Ozone Days Look Like This Year? New Jersey and its neighboring states have exceeded the ozone standard. Because of differing meteorological and air quality conditions, each exceedance looks different in terms of where ozone was formed and transported to cause exceedances at particular monitoring sites in New Jersey’s two multi-state nonattainment areas. Below is each ozone exceedance beginning in 2015, analyzed and explained.